This 100% cotton babysuit? hints at the tiny hero or heroine?s grand arc of life lying ahead. Tiny heroes and heroines, with the grand arc of life lying ahead, will create their own legendary narratives. 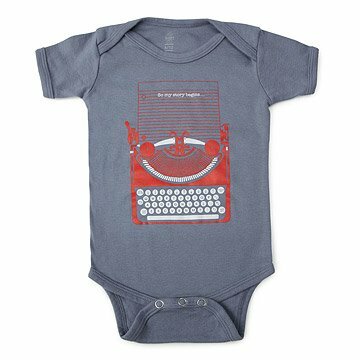 The "So My Story Begins" Babysuittm Outfit evokes the opening lines of a grand, old-fashioned tale. Love, adventure, comedy and suspense await the eager readers of this unique and fascinating new saga. Made from super-soft, 100% cotton. Machine washable. Designed by Enormous Champion in Brooklyn, NY, made in Los Angeles, CA. Just as I had hoped. I like this item. However, the review process is a bit much. You are asking for more information than is relevant to the purchase of this item. I think the baby will fit into this perfectly! So cute for new baby. Unique onesie. Gift that made us cry happy tears ! This was a baby gift for my niece. She is a cancer survivor. Their theme for the wedding and life is "now our story begins". Made the girls cry happy tears ! Gave this to a friend as she is waiting for her first grandchild. Her daughter, the baby's mother, is a writer, so it was perfect! I usually avoid clothes with words on them ... But my son and his wife are both writers and this is their first baby .... So ... This was perfect. I hope they like it! Very pleased with quality and design...The color scheme coordinated with the "old fashion" typewriter design.. Perfect message for a newborn! The message is perfect for a newborn and Mom and Dad. Loved the colors and design.